We are very pleased to announce that Talend Open Studio's 6.0.0 release is available. This general availability release for all users contains many new features and bug fixes. Find the latest release notes, with these steps: [Data Integration | Big Data | Data Quality | MDM | ESB] product tab > at bottom of page under "User Manuals PDF" > find this version's release notes. - https://jira.talendforge.org/browse/TDI-31572 : JVM Visualization: not finished, but much improvements done. - New IPAAS / IPAAS_DQ branding (except images..), and Ipaas automatically available for every platform license. - https://jira.talendforge.org/browse/TBD-1939 : TBD-1513 [MongoDB] Add Kerberos authentication. - https://jira.talendforge.org/browse/TBD-1952 : TBD-1513 [MongoDB] The ReadPreference option should not be on the tMongoDBConnection. - https://jira.talendforge.org/browse/TBD-1972 : TBD-1513 [MongoDB] Allow user to query the root node of the database. - https://jira.talendforge.org/browse/TDQ-8428: Sampling algorithm to run Analysis on a sample of data which is not necessary the first 1000 or first 5000 rows. tSAPInput are no more available in Open Studio version 6.
how to migrate this componante? witch one is replacing it? We are currently looking into your question and will get back to you soon. The problem with libraries in custom components still exists. Is there a new way to deploy the libraries of custom components? It affects a lot of my projects and is mission critical! Please note that both tSAPInput and tSAPOutput are essential for use with SAP R/3. Without these components a significant Talend user base is shut off. Talend ships since 5.6.2 with improved and completely rebuild SAP components and wizards. The new components are a huge step forward compared to the old but they are only available in the enterprise edition because of license issues. Because of the new components I guess Talend has decided to deprecate the old components in 5.6.2 and in 6.0 the old one are gone now. I am a bit surprised this essential change is not mentioned in the list above. In other words it is a deliberate strategy to drive Open Studio users to the enterprise version. The old components in Open Studio were not only good enough for small organisations, they were useful in developing a skill base out in the market place. Come on, how many such changes do you have experiences so far in Talend. Especcially for the SAP part I can tell you Talend has invested a lot of money and they cannot give all the stuff away for free. SAP topics are not really a matter in which the developers cannot earn money. I had to delete a .m2 folder to load my workspace. @Jcs19, since version 6.0, talend studio requires a JDK to build jobs, for more information, see this article. I hear what you are saying and it is not unreasonable. Unfortunately the step between open and enterprise is a very large one. I certainly wish there was a version between the two product levels. I think having the old connectors available would still be a good move since it does make it accessible for training and education which increases the talent pool for the tools set. >>Find the latest release notes, with these steps: [Data Integration | Big Data | Data Quality | MDM | ESB] product tab > at bottom of page under "User Manuals PDF" > find this version's release notes. I'm getting a "Page not found" for "DocumentationSet_TOS_DI_6.0.0_English.zip" on both US and Europe mirror. We've tested and it is working on our side. Can you try again? on both US and Europe mirror. While no error for TOS_BD-20150702_1326-V6.0.0.zip. I use in some critical projects the tSAPInput component (for RFC calling). If it will not be supported I shall not go to the new version of Talend! @tnomachi: can you provide more information about your issue. From which browser? I cannot reproduce this issue. @paolospinelladcy: We understand this can be a problem. 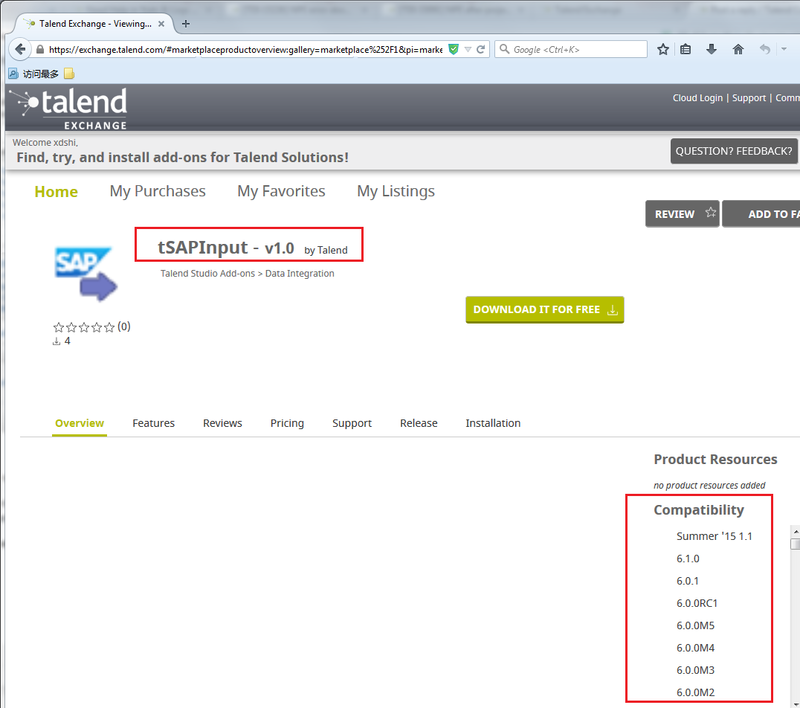 We will soon post the SAP component on Talend Exchange for the Community to maintain it. Sorry for the inconvenience. using Firefox 39.0 and Internet Explore 11 on Japanese Windows 8.1. Please provide your input there to help our R&D team to figure out the right fix. Have you tried to download other documentation than the release note? If not, could you give it a try please? Thanks for your help. DocumentationSet_TOS_BigData_6.0.0_English.zip. Please note that no error occurred with TOS_BD-20150702_1326-V6.0.0.zip. or the Page not found error using Firefox 39.0. 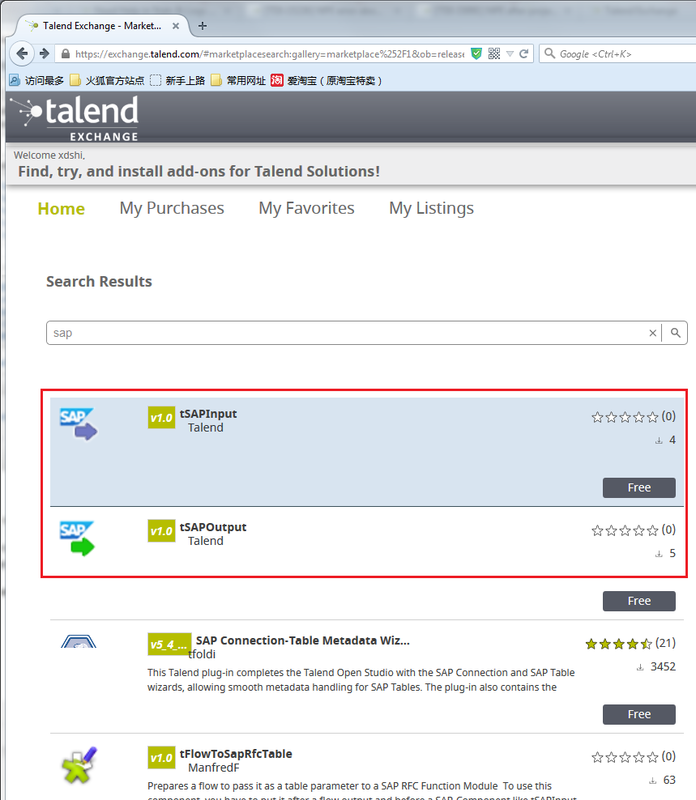 We have published open source SAP components on Talend Exchange officially. You can download tSapInput and tSapOut components freely from Talend Exchange Portal and install them into your open studio. Thank you. This is fantastic news.